Sports Illustrated story: Nashville Predators double down on oft-troubled forward Mike Ribeiro. 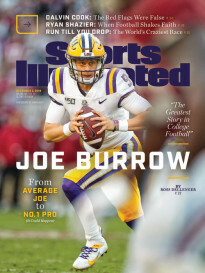 This story appeared in the March 2, 2015 issue of SPORTS ILLUSTRATED. Like a tight spiral from Aaron Rod­gers or a Yuna Kim triple-triple, a pass from Mike Ribeiro is a thing of technical beauty. With pinpoint precision and immaculate timing the Predators’ center can thread the puck through the most fleeting of seams and onto the tape of a teammate’s stick. Against the visiting Devils on Feb. 14, with the score 1–1 late in the third period, Ribeiro settled the puck at the right halfboards and waited. With two New Jersey players positioned between him and the slot, he noticed Nashville defenseman Victor Bartley sneaking toward the net on the weak side. In one smooth motion Ribeiro finessed a hard, flat pass through the open lane between the pair of Devils and across the ice to the blade of Bartley’s stick. Bartley tapped the puck across the front of the goalmouth to forward Colin Wilson, who buried what would prove to be the game-winning goal. Taking a feed from Ribeiro is easy, his teammates agree; the hard part is being ready for it. Ribeiro, who is tied for eighth in the NHL with 38 assists, has given Nashville’s offense a creativity it has long lacked, a big reason why the Predators have the league’s best record and are serious contenders to lift the Stanley Cup. 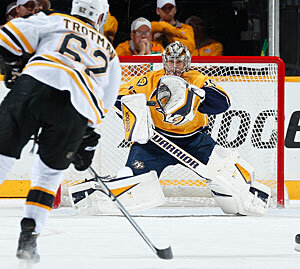 Always known for uncompromising defense, Nashville has historically struggled to score. And while the teams in Music City have frequently been good, making the playoffs seven times in eight seasons from 2003–04 through ’11–12, they haven’t been Cup-worthy. In the Predators’ 15 NHL seasons they have ranked in the bottom third of the league in scoring eight times. This season, thanks to Ribeiro, new coach Peter Laviolette’s attacking scheme and a cadre of fresh faces, Nashville has a potent attack to pair with the league’s second-stingiest­ defense, which is giving up just 2.27 goals per game. The Predators are scoring 2.92 goals per game, tied for seventh in the NHL, and have the league’s ­second-best goal differential (+39). At the very least Nashville fans can hope that this year’s team will be the one to advance beyond the second round of the playoffs for the first time in franchise history. Signing the 35-year-old Ribeiro—who last June was unceremoniously bought out by the Coyotes just one season into a four-year, $22 million deal—was a risky move on the part of Nashville GM David Poile. Courteous and thoughtful, the bespectacled Poile has neither the look nor the manner of a gambler, though he did enter this season on a run of bad luck worthy of the Vegas strip. Any bold moves he had made in previous years seemed to blow up in his face. In February 2007, Nashville—with an uncharacteristically strong offense led by Paul Kariya—was poised for a strong playoff run, and at the trade deadline Poile sent two players and two draft picks (one a first-rounder) to the Flyers for center Peter Forsberg. The deal quickly turned into a bust, with the former MVP hobbled by foot and ankle problems that would soon end his career. The Predators lost in five games to the Sharks in the first round. In February 2012, Poile traded for Canadiens winger Andrei Kostitsyn. Three weeks later the GM repatriated Alexander Radulov, a talented but embattled winger who left Nashville for Russia and the KHL in ’08. “It felt like we were really going for it,” Poile says. The Predators beat the Red Wings in the first round, but before Game 2 of their ­second-round series against Phoenix, Kostitsyn and Radulov were found to have broken curfew. Poile described their actions as “selfish” and “unacceptable,” and then-coach Barry Trotz sat the pair for two games. The Coyotes sent Nashville packing in five. Those moves hang over Poile like a cloud, but he hasn’t shown any greater aversion to risk in the last 10 months. Last April, after the Predators failed to make the playoffs for the second straight year, he fired Trotz, the only coach the franchise had ever had. Two months later Poile traded for Penguins triggerman James Neal and then signed Ribeiro in July. And last month Poile scored coveted defenseman Cody Franson in a trade with the Maple Leafs, a move that rounded out the league’s strongest blue-line corps. Despite appearances, Poile insists that he has made no rash decisions. “Poiles are planners,” he says, smiling. Poile never planned on Ribeiro. But to be fair, nobody did. When Arizona GM Don Maloney cut the center, citing “real behavior issues [that] we felt we could not tolerate going forward,” he essentially stamped Ribeiro as damaged goods to the rest of the NHL. 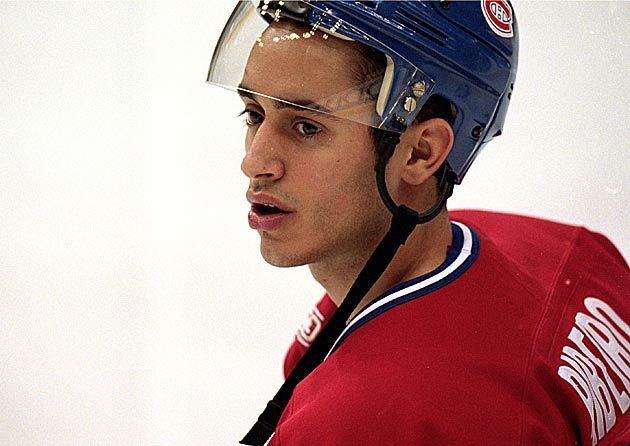 Ribeiro was a highly touted playmaker when he broke into the league with Montreal, and he scored 20 goals, with 45 assists, in 2003–04, his third NHL season. At the same time, though, he was also earning a reputation for enjoying the city’s nightlife. ­Ribeiro has never been far from controversy. He fought with Canadiens teammate Saku Koivu at a morning skate in ’04. On the eve of the ’06–07 season the Canadiens traded Ribeiro, who was coming off a 51-point campaign—his second straight season with more than 50 points—to the Stars for hobbled defenseman Janne Niinimaa, a move that had more to do with subtraction than addition. In October 2010, Ribeiro; his wife, Tamara; and two friends were arrested for public intoxication at a suburban Dallas restaurant. Given Ribeiro’s history, there was little interest in him when he was forced into free agency last summer. To find a job he had no choice but to make the first move—and to come clean about his past. Through his agent he reached out to Poile in early July. They spoke soon after, on an hourlong Skype call that included Tamara. They didn’t talk at all about hockey. Instead, they discussed life. In February, Tamara traveled to Arizona with 13-year-old Mikael, her oldest son, for a hockey tournament, and took the boy to see his father. “We walked into his house, and it was a mess,” she told TVA. “He was really skinny. I was afraid that this would be the end of him.” She considered coming back to Phoenix, but Bob Perno, Ribeiro’s longtime agent and adviser, urged her not to. In April, after a dismal season in which Ribeiro had 47 points—his fewest since 2002–03—he asked Tamara if he could see his kids. Tamara said no. “When she said she had had enough . 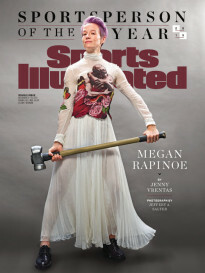 . . that her kids were not going to grow up in my lifestyle . 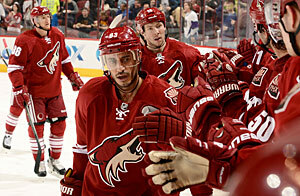 . . that shocked me,” Ribeiro told TVA. He called the league’s director of counseling and then reported to a rehab facility in Arizona, where he spent 45 days getting sober. The Coyotes cut him anyway. The deal came with an ultimatum. “Look,” Poile told Ribeiro, “this is real easy on my part. You could be our No. 1 or No. 2 center, and this would be fabulous for us. This could be great for you and your family, too. You can forget about what happened in Dallas, forget about what happened in Phoenix. It’s a brand-new start. “Do you want to do this?” Poile asked again. On the ice Ribeiro has once again become an elite playmaker, helping to push linemate Filip Forsberg, who has 20 goals, to the top of the rookie-of-the-year race. In the first period against San Jose on Feb. 17, Ribeiro forced a turnover in the Sharks’ zone and then slipped a no-look, behind-the-back pass to defenseman Mattias Ekholm. The sleek move, which seemed to catch even Ribeiro’s teammates by surprise—the pass went to Ekholm because forward Craig Smith missed it—helped set up the go-ahead goal in a 5–1 win. “He plays with a lot of deception,” Neal says of Ribeiro. Even if their revamped look up front garners the most attention, the Predators’ engine is still on their blue line. Nashville’s defensemen, led by the top pairing of Shea Weber and the smooth-skating Roman Josi, the best player nobody knows, lead the league with 153 points. Laviolette’s system is predicated on aggressive play in all three zones. The Predators forecheck with vigor, looking to create turnovers, and their defensemen are much more involved in the attack than in years past. In the offensive zone Nashville forces pucks toward the net, believing that shot attempts, even those that miss wide or are blocked, are integral to controlling play. The Predators rank fifth in the league in CorsiFor per 60 minutes (58.4), a loose measure of shot attempts per game, and Neal, who has scored 21 goals, trails only Capitals sniper Alex Ovechkin in the category of five-on-five shot attempts per 60 minutes. If Nashville makes a run this spring, it will still be primarily because of goalie Pekka Rinne, a leading MVP candidate, and the team’s defensemen. But the strategic moves Poile has made—­hiring Laviolette, taking a chance on Ribeiro, trading for Franson—will have helped. Poile may insist that he’s not a gambling man, but he certainly knows what it means to go all-in.